This USB 2.0 cable by DigitMX can be connected to an active USB port and enables an extension of 10 .. 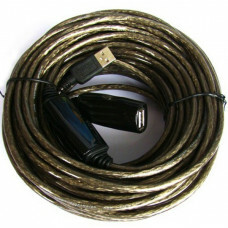 This USB 2.0 cable by DigitMX can be connected to an active USB port and enables an extension of 15m.. This USB 2.0 cable by DigitMX can be connected to an active USB port and enables an extension of 20 ..